As Steve posted a few days ago, Connie and I did make a quick trip to New Mexico to look at Aussie pups. 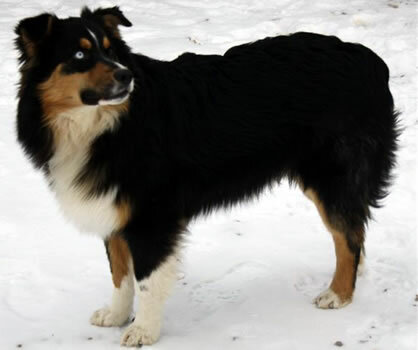 After our lab mix Maggie died in January, our Aussie Sadie has been pretty sad and lonely. We've planned all along to get another dog, and an Aussie was our preference. 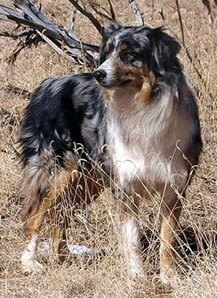 Connie started doing a lot of on-line research, and found a breeder in New Mexico we were impressed with,Desert Willow/Boyd Ranch Aussies. 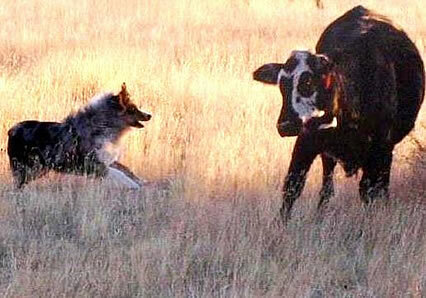 They had three litters out at Boyd Ranch, all from working Aussies, and we went down to take a look. 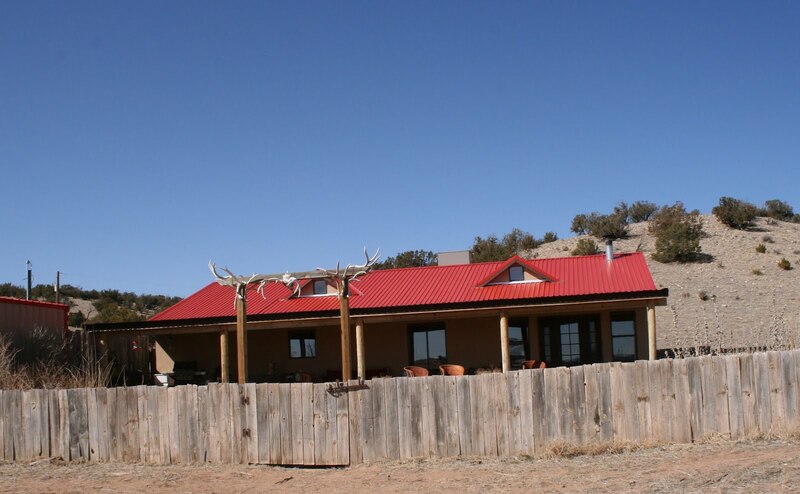 Boyd Ranch is located in the foothills of the Manzano Mountains, southeast of Mountainair. It is in a beautiful setting and we had lots of fun just driving in. We want to thank Curt and Susan Boyd and Theresa Gorduyn for their hospitality. Our initial thought was to get another female, but by the time we made the trip we had decided on a male. We found two brothers from one of the litters that we really liked. We worked very hard to decide which one we wanted, and ended up not making a decision and taking them both. One is a black tri-color. 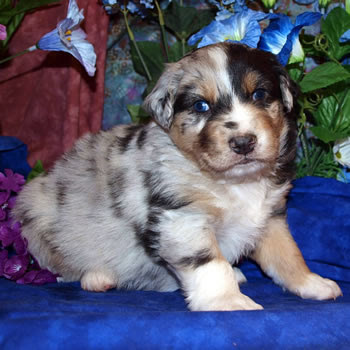 The other is a blue merle. Both appear to be handsome, intelligent, and affectionate boys. As I mentioned earlier, these dogs are bred for work, not primarily for show, and the parents of this litter both work cattle as their day jobs. Here is a picture of the father, Tucker, who we didn't get to see as he was elsewhere engaged in breeding duties. He's a black tri, as you can see. 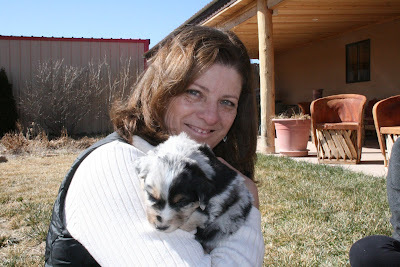 Here's the mother, Skidboot, who is a blue merle. "Our dogs typically do not work cattle without us, but one morning I caught Skidboot (and her BFF Chappy) independently moving heifers in a pasture by the house under a nearby tree. It was very hot out and Chappy was bringing them in (a few at a time) to Skidboot who then held them under the tree. We are sure Skidboot was the one giving the orders because she was in the shade while Chappy had to work in the sun!" Sounds like my kind of dog! The boys are still with Skidboot and we'll be back down to pick them up in another three weeks. Ha! 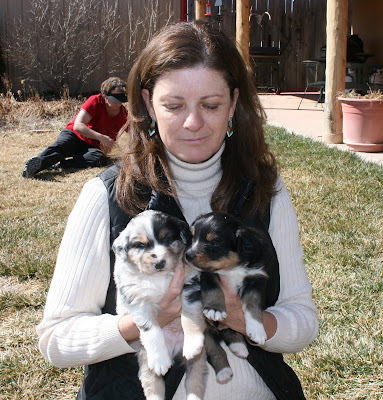 I have done the same thing myself--intend to get one pup, but then end up with two! I really do like to raise a couple of littermates together--it is hard on a pup, I think, when you have to work outside the home all day, and they have to be alone for long periods. Having a sibling to play and snuggle and squabble with makes for a much better adjusted dog, in my opinion. Plus, it is just FUN to raise two together! Looks like you got a coupla champeenz there!....L.B. Those Aussies look great, especially the Tri-color pup and his dad. They remind me of my late, great Roscoe. You hit a home run with those two pups. There will always be a spot in my heart for Aussies. However, I'm glad it's you and not me starting over with puppies. My Brittany has finally made the turn (mostly) out of puppyhood. She's chewed her way through about a $1,000 value of shoes, clothes, furniture etc. 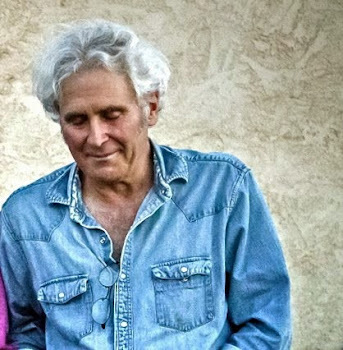 We'll be VERY happy if the tri grows up to look like his dad. 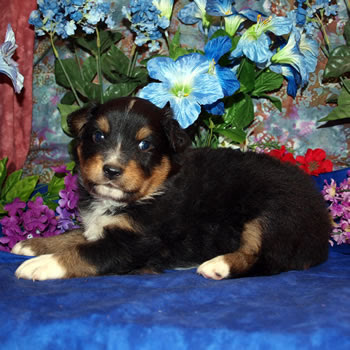 I think Roscoe is just a great name for an Aussie. Ole Roscoe was not a nipper. He was a blindside "noser", usually wet and usually when I had on light colored dress slacks. I suppose it was his way of establishing early morning order. He'd do it once mid-thigh, head bump and run, and that was it until the next morning. As annoying as it was, I sure miss it. Just a dissenting opinon. I would not raise two pups from the same litter together if their primary purpose in life was as a companion or if they were to grow into a job that requires close cooperation with a human. If you read The New Knowledge of Dog Behavior you will see that the Guide Dog group stopped raising two puppies from the same litter in a home. One pup never seems to grow up to stand one it's own but remains dependent on the presence of the other dog. I am a pro dog training working with retrievers for hunting and competition. I have raised 40 or more pups for work in my career. Well, Pat, I haven't read "The New Knowledge Of Dog Behaviour" (but I have read plenty of similar titles--funny how most books on training or behaviour about dogs have the word "NEW" in the title, but they end up rehashing a lot of stuff that has been published decades ago....) but I HAVE raised a lot of pups myself, alone and together, and I will say without doubt that those raised with a companion were a lot happier to have a buddy--not so whiny or clingy. And they were every bit as good companions and workers to me as any I raised alone. I have always found the intense, close bond they form with each other touching and admirable--I wish I had had such a close sibling growing up!.....L.B. as "Genetics and the Social Behavior of the Dog" write up of twenty years of research. THe intense bond between the pups you mention is one of the very things that interferes with the pup forming a close working bond with a human. I am a professional trainer of working retrievers and have raised many dogs in 35 years of professional training. I have trained many dogs that were raised with litter mates. I have never seen both pups turn out well. I have raised more than 40 some puppies for specific tasks that require a close working relationship with a human. I would never raise litter mates together. ....I suppose that depends on what one defines as "turning out well"! THAT certainly is a varying concept! I could see that interfereing with the type of intense training and control necessary for guide or retriever trial work, but few people need that kind of control for a pet or companion. And for other types of canine work or functions, the littermate bond can be quite an advantage! I have raised and trained quite a few sled dogs, and closely bonded littermates work MUCH better together, in my experiences. Also for pack hunting(sighthounds and scenthounds) and watch dogs, having dependable "back-up" gives dogs great confidence and helps them handle tricky situations better--a lot of this is dogs who must work somewhat INDEPENDENTLY from humans, of course. I wonder what Cat U. thinks of littermates as livestock protection dogs?? At the risk of sounding TOO diplomatic, I think we're talking apples and oranges here. Though I prefer raising a single dog at a time in terms of intimacy, I have had litter mates work quite well in the context of a sighthound pack. My dogs are intimate in-house dogs, but not intensely trained in the obedience sense, nor the way serious competitive bird dogs are trained. Basically they learn housebreaking, "no! ", don't eat pigeons or hawks (the first not always successful unless one is there to enforce it), go to bed, and above all, the recall. As they are hounds who both chase and retrieve naturally, they learn the rest of their repertoire on their own and from the other dogs. I guess my ways are more like those of Konrad Lorenz or Vladimir Beregovoy, in that I often feel I am studying them as much as training them. But I know very good dogs that have been trained classically and love every minute of it as well laissez-faire salukoids like my own. "Horses for courses." I guess there is truth in all three answers to this discussion. As Steve so rightly points out the best way to raise the pup depends on what you are raising the pup to be/do. I was speaking from my own perspective. With the long delay between posts and no facial expression for feedback I think our differences are magnified and an agreement that could be reached in two minutes in direct conversation has taken four or five days to get to. Yes, Different Horses for different courses. Yes, Pat, that is a big problem with computer communication--I am always amazed when people get huffy about something being discussed if I disagree with them; I always want to say, "But I didn't mean it THAT way!" Just goes to show how much of our communication is in tone of voice, inflection, and expressions--something to take into account of course, when dog training, as being every bit as important as the command words themselves! And, by the way, I HAD read that book--just took me awhile to recollect--I didn't like it at ALL( I said, in a calm, friendly, conversational manner)--although it had some fascinating behavioural information, I couldn't get around the fact that they sacrificed HUNDREDS of dogs coming to those conclusions--especially the Basenjis, which are a favorite breed of mine! I heard that when the experiments were finished, they just euthanized the majority of the dogs--although the unsocialized ones likely could never have found good homes anyway.....L.B.